As the NewFronts wrapped up, there was a growing feeling that online video wasn’t just a precursor to the Upfronts and broadcast that were coming next. The NewNew Fronts are becoming the main event. Traditional TV networks are losing their audiences as competition from non-linear, streaming programming is rising — everything from Netflix and Hulu to Facebook and Snapchat. Digital ad spending overtook TV ad spending for the first time last year ($71.6 billion versus $71.2 billion, respectively), according to eMarketer. A new report commissioned by the IAB found that spending on ads around original digital video programming has doubled in the past two years. These inescapable trends are creating a new frontier for publishers trying to reap the benefits of the video ad boom. Broadcasters and newspapers are trying to figure out how to allocate more resources for video, while digital-native publishers try to keep up with demand. With that in mind, here’s a rundown of some of the winners and losers in the online video explosion. NBCUniversal, the digital offshoot of the traditional broadcast network, earns major points for having invested $500 million in Snap (think long-term, not just the first earnings report! ), $400 million in BuzzFeed and $200 million in Vox, thereby creating partnerships that benefit both traditional and new media players. When Conde Nast joined the NBCUniversal and Vox Media advertising network, the digital conglomerate announced it’ll reach 200 million consumers online, including 99% of all millennials in the U.S. And these three entities are together developing two new ad products around mobile video and branded content. If there is a behemoth winner in the house, it’s surely Facebook. The world’s largest social network has pushed its news feed to prioritize video, and publishers have to post videos there if they want to reach Facebook’s nearly 1.3 billion daily users. Recode’s Kurt Wagner reported last month that Facebook is planning to pay publishers to create more produced video on the platform, to help push its new mid-roll ad products (the new deal will replace the one Facebook struck with publishers last year to use Facebook Live). Facebook will offset the cost of paying publishers by earning the money back from the mid-roll ads, and then splitting whatever revenue remains with the publishers. While some publishers are hesitant to embark on such a deal with unproven benefits — no one knows how the ads will fare yet, and earning returns on Facebook video has long been a frustration for publishers — many others will give it a shot. Like Facebook, Google’s YouTube is riding the benefits of the online video boom. YouTube may have stumbled earlier this year when advertisers found their content showing on extremist videos, but it’s still the world’s most popular video destination. And now the world’s most popular video website is planning to produce six different ad-supported original series and develop more than 40 original shows and films over the next year. It’s also investing more resources into its ad-free subscription service YouTube Red (and the YouTube TV skinny bundle), pushing YouTube into a tier of competition that includes Hulu, Amazon Video and Netflix. Google earned more than $24 billion in advertising sales in the first quarter — more than that of the entire TV industry – even in the face of boycotts over brand safety. The tech giant is betting on high-profile YouTube stars and celebrities to bring viewers to these advertisers, and has made changes to improve controls for advertisers. If it continues to cultivate a wide audience around its original programming, it can certainly demand higher rates from advertisers even in the face of setbacks. The Gray Lady may have been a late bloomer to the digital boom, but its adaptation strategies are certainly catching up. Its subscriber growth is the highest its been in its history, thanks in large part to the post-election bump — as well as wise investments on digital offerings. If you haven’t noticed, many articles online now feature video content alongside it. In February, the Times announced it’ll feature fresh daily content on Snapchat Discover. Alongside pushing VR video as an editorial decision, it’s also been publishing VR branded content. And at this year’s NewFronts, the Times announced “Times Story[X],” which will launch this summer and serve as a powerhouse for creating strong visual, technologically forward narrative journalism that both the newsroom and its marketing unit T Brand Studios can use. The four major broadcast networks lost 8% of their audiences this TV season, adding to a four-year trend of declining TV ratings. TV networks have also increased their ad prices in these last four years in an effort to offset declining viewership — which doesn’t necessarily bode well for marketers. The ad-buying agency Magna has announced it’s shifting $250 million of its budget originally allocated for TV toward YouTube. The Walt Disney Company, which owns the ESPN cable network, missed its revenue target this past quarter and announced in April it’s laying off 100 people to cut costs and better adapt itself for digital distribution. Time Warner and Viacom have also reported that second-quarter advertising revenues are likely to decrease. It’s no wonder: Viacom’s MTV, once the go-to network for younger audiences looking for information and entertainment catered to especially for them, is losing its viewers to Snapchat and YouTube. Advertisers know that they can guarantee audience reach with the time they have with television advertising. Traditional TV has also benefited from the brand safety issues marketers have faced when their content has inadvertently popped up against extremist propaganda on YouTube. Networks touted their reach and reliability for serving up mass audiences, in a New York Times story, but they also face tough competition from targeted ads on social platforms and the explosion of choices on streaming services. But it’s still a question of when, not if, those ad dollars will move to digital video. In the end, the winners of the video boom will be those publishers, platforms and brands who embrace the power of video, but make sure it fits with their mission – and serves their intended audience. Native video publishers like NowThis and Hulu might have an advantage, but legacy publishers and broadcasters still have a chance to shine if they can evolve quickly. The market dominance of Facebook and Google is concerning. Google operates seven platforms with more than a billion users globally: Google itself, Google Play, Gmail, Chrome, Android, YouTube, Google Maps. It also operates five of the top 10 apps. It’s data machine monetizes user information through paid search, through the Google Display Network (GDN) and through YouTube. Facebook has more one billion people using it every day, Instagram has 600 million uses and Messenger and What’s App have another 1 billion users. Three to four of the 10 most used apps are operated by Facebook. Facebook Audience Network competes with Google’s GDN among mobile publishers. The company is video centric and this forces a dependency on content outside of their network. To date, new models and interfaces have not disrupted the duopoly or the dominance of these two players. Technologies growth and advancement in both hardware and software is shifting market dynamics from the Information Age to the Intelligence Age. Today’s digital strategies must include plans to build a content destination that allows users to find, experience, share and buy and have the high probability for sharing and recommending. In an era when many publications are contracting, The Washington Post is expanding, particularly in the group charged with producing and hosting web videos. To understand why, we spoke with the Post’s Micah Gelman Senior Editor, Director of Editorial Video. Tell us about the recent expansion in the video department. We recently posted close to 30 new jobs in the video department to expand our efforts in two basic ways. First, we want to present videos with our news stories when it’s complementary to the story. Second, we’re developing content for over the top delivery, and delivery in UGC and social media sites, to position The Washington Post as a video destination. Let’s look at the first focus. Where does video fit in for a newspaper? The Washington Post produced six hours of coverage of the Women’s March with over 8.3 million views. (Editorial note: per Facebook statistics, the Post had over 4.1 million views for the election and inauguration, and over 8.3 million views of the Women’s March). Video has become a core part of our mission to present readers with a full 360 view of the news; it’s complementary to the written story, not either/or. Some news is inherently visual, so we present video as part of the story. Sometimes video enables a deeper dive into the content, so we present that. Sometimes, the story is live and we produce that as well. For example, we broadcast the recent presidential election on Facebook Live for eight and a half hours, the inauguration for about nine hours, and the Women’s March for about six hours. Each event drew millions of viewers. Overall, we want to become a one stop shop that presents our readers with the story produced in all the formats that it should be in. What percentage of stories do you cover directly as opposed to using footage from other sources? How will this change over the next 12 months or so? Today, about 40% is original, and 60% is from other sources. However, even when we use third-party video, we put our own editorial package around it, adding reporting, annotations, and other elements that makes it original. Over the next 12 months, we’ll double the size of our video staff and that’s probably going to flip to 65% original content. Though our base is in DC, we’ve sent video journalists to North Korea, China, to cover multiple terror attacks overseas, as well as covering stories all over the United States. Our readers are global and so is our video coverage. And this will expand greatly over the next few months. Can you elaborate on your over the top strategy? 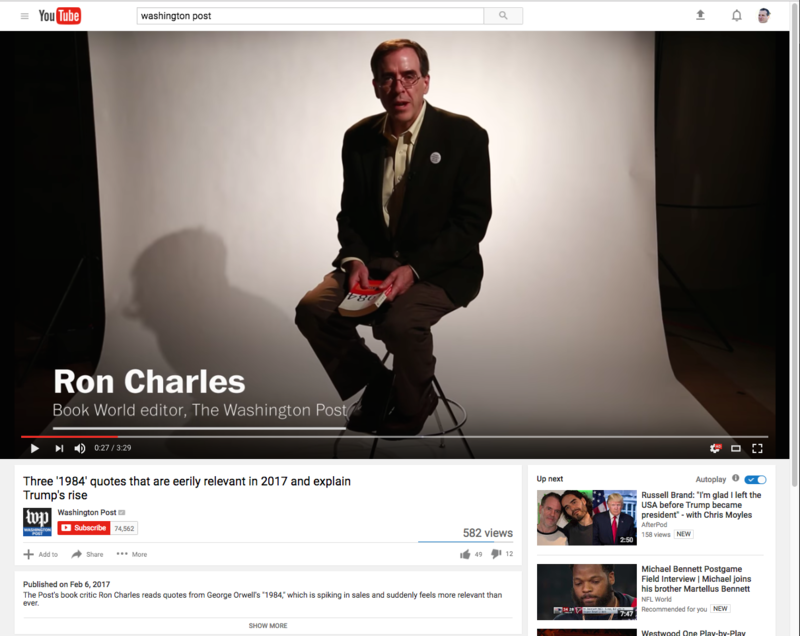 A Washington Post YouTube video discussing how quotes from 1984 are relevant in 2017, dramatically boosting sales of the book. The next phase of growth is to position The Washington Post as a destination for video. We want to change the perception of The Washington Post as a legacy newspaper with video, to a video-first enterprise, essentially re-imagining The Washington Post as a video destination, not only on Facebook Live, YouTube and other social media sites, but also over the top via Apple TV, Roku, and Fire TV. Editorially, what works well in an article page typically isn’t as effective as a standalone video consumed on a living room TV. So, we’re producing longer, more scripted pieces with studio quality production value. We’re adding YouTube-style personalities, and producing video to distribute not only through our own OTT apps, but through other channels as well. Again, it’s video as the destination. 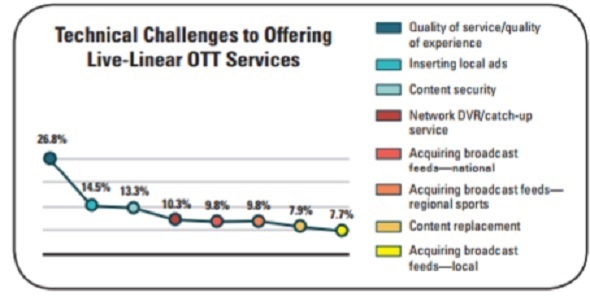 How do you market OTT content? That’s the key question. We have to use all available megaphones to call attention to what’s new and what’s different and promote our discoverability, to let our readers and viewers know what’s available. Talk about what you’re doing on social media. We’re producing 150 to 175 events a month on Facebook Live, YouTube Live and our own website. While it’s easier to monetize video on our own site, Facebook Live and YouTube Live provide scale because we’re attracting an audience that wouldn’t come to our site. So, it’s very valuable to us to be on both sites, and other social media properties. How does Facebook Live compare to YouTube Live? Facebook has been very aggressive in their own repositioning to a video destination, which obviously YouTube already was. YouTube viewers are on that site to watch multiple videos, which is obviously good for us, while Facebook viewers are a bit more passive and on the site for a range of content. They’re both really valuable audiences to us in different ways. Can you briefly describe the tools you use to capture/edit/encode/deliver your streaming videos? We shoot either using DSLRs, or with Sony FS5 cameras, which are 4K and deliver more broadcast quality. We use LiveU on-camera transcoders/transmitters for sending live feeds from the field, and edit in Adobe Premiere Pro. We have about 40 on our video staff, almost all capable of shooting and producing events, with about 32 regularly shooting and producing. Fortunately, we’re far enough along in the evolution of video journalists that many of our staff have experience in other places. Otherwise, we have staff who worked in TV, some who came through photography, and some that were trained as multimedia journalists. The media environment still presents numerous growth opportunities despite the competitive marketplace and the struggle for consumer attention. Importantly, PwC’s Annual Global Entertainment and Media Outlook Report projects the U.S. media and entertainment revenue will increase and account for $632 billion, or 29.4% of the worldwide total of over $2.1 trillion. Further, the entertainment and media revenues are expected to grow at a compound rate (CAGR) of 4.4% from $1.7 trillion in 2015 to $2.1 trillion in 2020. In order to provide this forecast for 2016 to 2020, PwC analyzed historical and projection data for advertising and consumer spending in 13 major industry segments across 54 countries. Internet advertising in the U.S. continues as the largest market in internet advertising revenue, projected to grow from $59.6 billion in 2015 to $93.5 billion by 2020 with a 9.4% CAGR. Important to note, internet advertising ($75.3 billion) is expected to surpass broadcast TV advertising ($70.4 billion) in 2017. Mobile has been a key driver of digital advertising revenue comprising 34.7% or $20.7 billion in 2015 of U.S. total internet revenue. 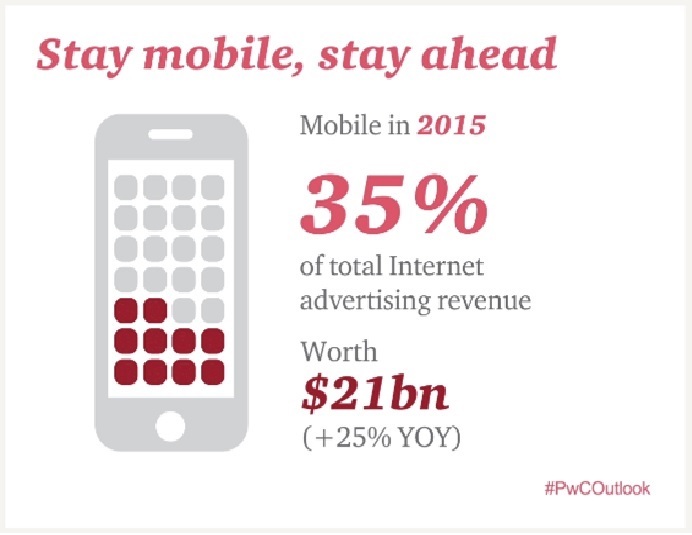 PwC projects mobile video advertising revenue will grow from $3.5 billion in 2015 to $13.3 billion in 2020 for an increase of 30.3% CAGR. Video on Demand (VOD) and over-the-top services (OTT) will drive TV and video revenue from $121.4 billion to $124.2 billion in 2020 (0.5% CAGR). In addition, TV advertising revenue is expected to rise from $69.9 billion to $81.7 billion in 2020 (3.2%CAGR). Continued declines are anticipated for newspaper publishing, declines of 2.9% CAGR by 2020. Further publisher consolidations are expected. As well, magazine publishing revenue is not expected to decline but register a fractional increase, from $30.5 billion in 2015 to $30.7 billion in 2020. In addition, radio is predicted to increase from $21.4 billion to $23.1 billion in 2020 (1.6% CAGR). Virtual reality devices and games will be the impetus for rising video games revenue from $17.0 billion to $20.3 billion by 2020 (3.6% CAGR). Virtual reality devices and games will be the impetus for rising video games revenue from $17.0 billion to $20.3 billion by 2020 (3.6% CAGR). 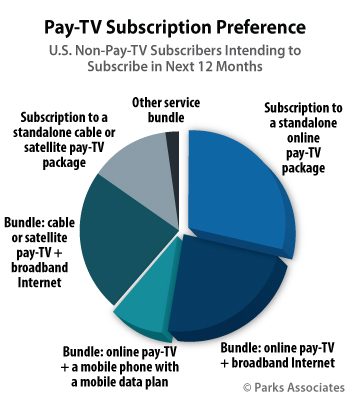 Overall, PwC projects that consumers will look for less expensive content bundles, streaming offers and less commercial interruptions. 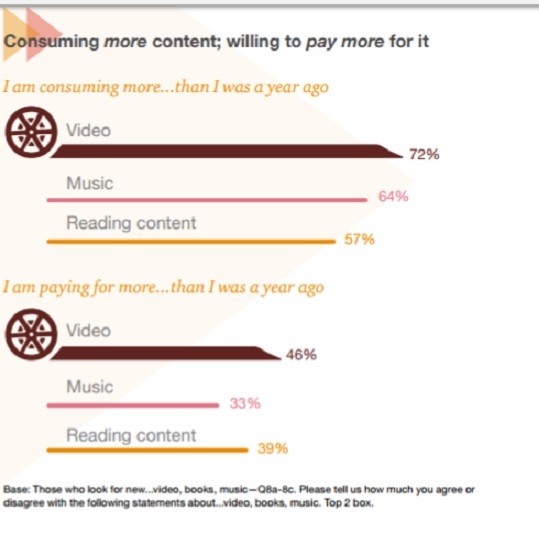 As a result, consumers’ share of time for ad-supported media will not increase. For advertisers and content providers, this means a detailed examination of the consumer experience to identify drivers of engagement and understand their impact on time spent and their influence on advertising effectiveness. 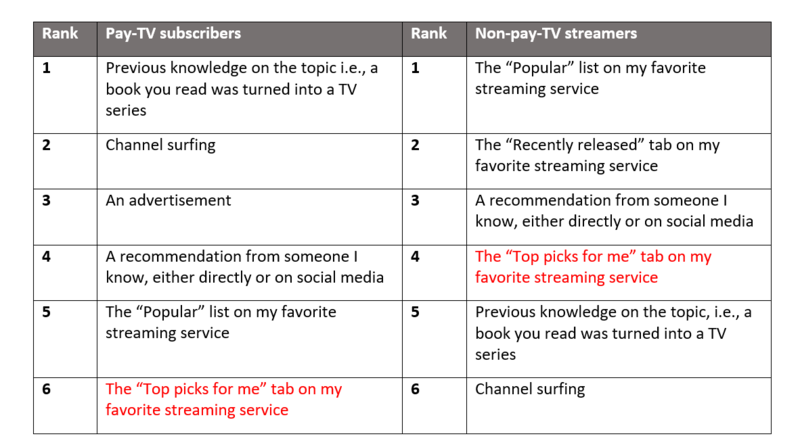 Overall, there are more connected TV devices in US households than there are pay-TV set-top boxes according to new consumer research from Leichtman Research Group, Inc. (LRG). Across all households (including those that do not have any of these), the mean number of connected TV devices per household is 2.1, while the mean number of pay-TV settop boxes per household is 1.8. LRG finds that 65% of US TV households have at least one television set connected to the Internet via a video game system, a smart TV set, a Blu-ray player, and/or a stand-alone device (such as Roku, Apple TV, Chromecast, or Amazon Fire TV) – up from 44% in 2013, and 24% in 2010. Among those with any connected TV devices, 74% have more than one device, with a mean of 3.3 per connected TV household. 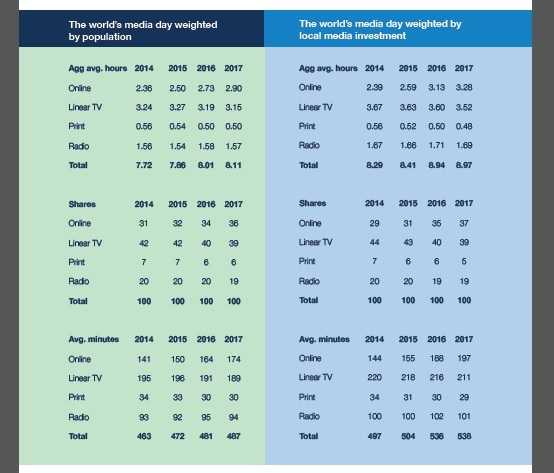 These findings are based on a survey of 1,206 TV households throughout the US, and are part of a new LRG study, HD and Connected TVs XIII. This is LRG’s thirteenth annual study on TVs in the US.